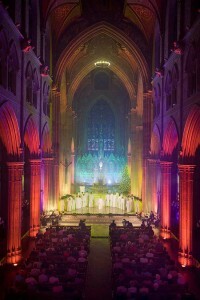 Lighting designer/director John Penny Williams worked with Robe moving lights supplied by leading Anglo-Irish rental companies HSL from Blackburn UK and Production Services Ireland (PSI) who are headquartered in Belfast, to create a beguiling lighting design at St Patrick’s Cathedral in Armagh, Northern Ireland. 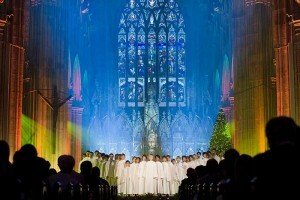 This was for a special “Christmas In Ireland” performance by the all boy choir super-group Libera, which was recorded earlier in the year and released as their annual Christmas DVD for 2013. Broadcast on PBS American public broadcast network, it has been aired on over 307 stations across 44 US states. John is a freelance LD with a successful 20 year career specialising in TV lighting and has worked in all areas of the genre from LE to multi-camera drama productions. He originally met Libera’s director Robert Prizeman whilst filming a series of the BBC’s ‘Songs of Praise’. Robert and TV director Medwyn Hughes asked him to design lighting for this DVD shoot. His brief was to make the space look ‘Christmassy and festive’ with no hardware intruding into the camera shots, a challenge he achieved with the help of 14 Robe MMX Spots and 12 LEDWash 600s amongst other fixtures. It was the first time he’s worked in St Patrick’s Cathedral, and he wove the stunning ecclesiastical architecture into the picture creating a truly magical, almost filmic ambiance and backdrop for the performance and recording. The origins of the church date back to 445, with the current building being most recently restored between 1832 and 1840 after being destroyed and rebuilt 17 times in its history! The MMX Spots were rigged high up and utilised for lofty side beams, while the LEDWashes proved excellent for washing across the altar and side walls of the nave. The creative challenge was to have something attractive in terms of lighting and visual effects behind all the close ups, and with that in mind, he managed to add plenty of twinkles to the proceedings! Using the LEDWashes zoomed right out he was able to use less fixtures for more coverage which was a great help. 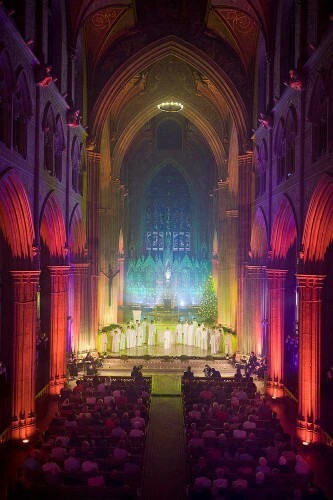 He and Andy Neves programmed and operated the lighting for Libera’s ‘Christmas In Ireland’ using M1 and ETC Smartfade consoles.